Average expenditures for Ohio car insurance policies rose 5.1 percent between 2009 and 2011, according to a new report from the Ohio Insurance Institute (OII). The OII, a trade association representing home and auto insurers throughout the state, says it projects that the average expenditure for an Ohio auto policy in 2011 was $648. According to OII estimates, the average Ohioans expenditure hit a low in 2009, when it was estimated to have been $616. The national average is estimated to have been $856. OII projections are based off a combination of data from the National Association of Insurance Commissioners on average expenditures, Bureau of Labor Statistics data on price trends and state regulatory data on effective rate changes from the state’s 10 largest coverage providers. The last time the OII estimated price changes for auto coverage, it anticipated a 2.8 percent jump in prices between 2008 and 2009. The state ended up seeing an increase of only 1.5 percent. 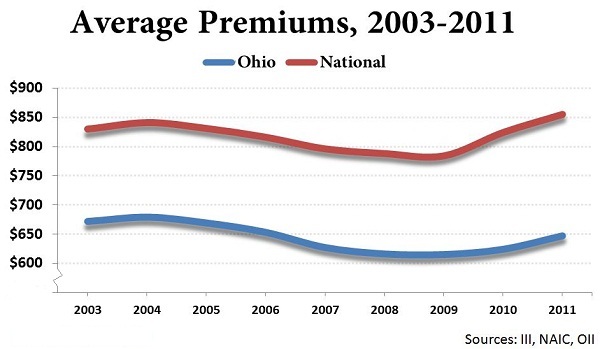 According to data provided by state regulators, 6 of the 10 largest auto insurance companies in Ohio raised prices between 2009 and 2010. The largest increase came from Grange Mutual, which boosted prices 5.1 percent. The biggest cut was from the Westfield Group, which reduced rates by 1.1 percent. The state’s 10 largest insurers account for about 74 percent of the state’s market. Upward Trend a Sign of a Hardening Market? A handful of industry groups say that the coverage marketplace may be hardening, and customers can expect to see higher prices in the coming years. Many of these projections are based on the shrinking profits and huge amount of claims that insurers have experienced over the past year, and they may decide to make up for those losses by slowly bumping up policyholders’ rates. According to the Insurance Information Institute, insurers are expected to pay out $35 billion on claims caused by natural disasters last year.